A mule deer doe who just walked out of the beauty parlor, the glory of early summer on display in the landscape. 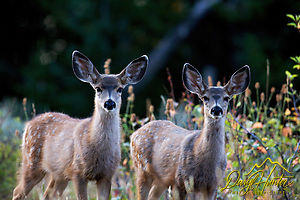 Whenever I surprise a mule deer doe or fawn, and alarmingly their heads pop out of the forage like a jack-in-the-box, appearing as though they just got out of the beauty parlor, their oversized, ever alert, ears reaching for the sky, their eyes wide and big as saucers they always demonstrate why “doe-eyed” has become a cliché for beautiful, innocent eyes. Beautiful in a different masculine way, majestic bucks proudly show off their headgear, large or small, like an organic statue of David. The most noticeable differences between whitetail deer and mule deer are the size of their ears, their ears proportionally are the size of a mule’s ears; hence, the name. These beautiful accents to the landscape can be found throughout Grand Teton Park, Jackson Hole hosts a prodigious population of Mule Deer; they can thrive nearly anywhere. Throughout the west their habitats include woodland chaparral, Sonoran desert, semi-desert, shrub woodland, Great Plains grasslands, shrub land forest, sagebrush steppe, and boreal forest. Mule deer are remarkably adaptable. This stocky deer has sturdy legs and is four to 6-1/2 feet in length and three to 3-1/2 feet high at the shoulder. Most Mule Deer are brown or gray in color with a small white rump patch and a small, black-tipped tail. Mule deer their fawns have white spots at birth, added camouflage to blend in with the foliage where the attempt to disappear. Bucks have antlers that start growth in spring and are shed around February, their antlers are high, and branch forward, and can attain a width of forty-eight inches wide. The life span of a mule deer in the wild is ten-years, but can live to twenty-five years in captivity where there isn’t the attrition of natural livening. Common predators of mule deer include mountain lions, coyotes, bobcats, golden eagles, and black bears. Mountain mule deer migrate seasonally from the higher elevations of the sub-alpine forests and cliff escarpments they inhabit during summer to lower elevations of Grand Tetons’ mountain valleys for the fall rut and rocky windswept buttes where it is easier for them to find food during the winter which also provides escape routes from predators when needed. 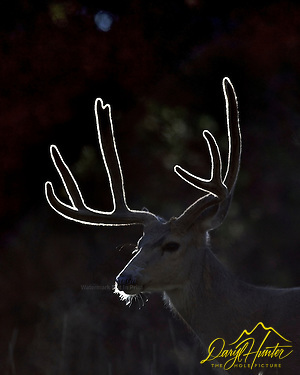 Mule Deer return seasonally to the same range. As do most ungulates bucks wander in friendly small buddy bachelor groups throughout the summer months as their antlers grow so they can fight one another in the fall. Dominance of a buck is typically a function of his size, the larger a buck’s, antlers, the better his chances are of winning the acceptance of does and fighting off his challengers. Genetics, nutrition and age have much to do with antler size. During spring and summer antlers are grow at an awesome rate, large bucks attain growth rates of up to a quarter of an inch per day, they are one of the fastest known types of tissue growth in mammals. Mule deer breed in late fall at which time bucks round up females and fight for their right to keep them. Doe’s begin to come into heat in November and with pheromones floating through the air bucks are naturally drawn to the does. Many bucks are willing to fight to the death over breeding rights with a doe. A mule deer’s diet is quite varied, muleys are browsers and in spring and summer they feeds on grasses, weeds, and herbs and eat a great variety of vegetable matter, including fresh green leaves, twigs, lower branches of trees, and grasses. As are most hoofed animals (ungulates) mule deer are active in mornings, evenings, and during the middle of the day mule deer bed down in a secluded and safe place. 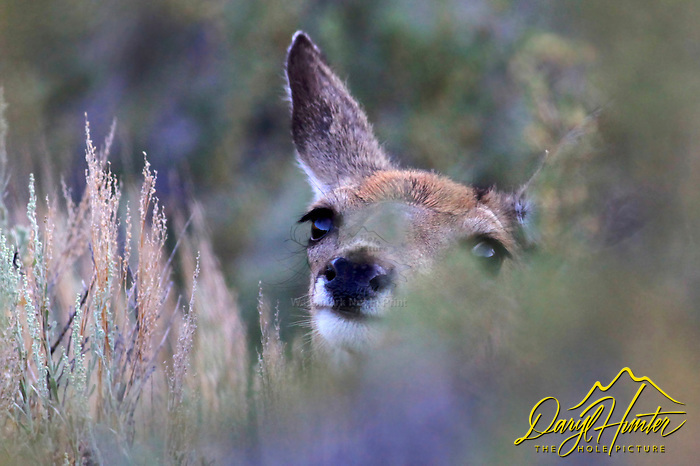 Mule deer have several strategies for avoiding predators, they can detect danger at a very long-range by means their large ears and excellent vision. Males can quickly detect and visually track another animal as far as 600 yards away. They do not run as other animals, their distinctive bounding leap launches them distances of up to twenty plus feet, they can reach a speed of forty-miles per hour for short periods doing their leaps. When necessary, they can reverse direction in mid-leap. Their leap offers two advantages: it enables the deer to out-distance predators in rough terrain, and mid-leap they can see above the thick brush. In the Greater Yellowstone we have tens of thousands of these beautiful creatures, and it isn’t hard to find them, at night they are often three feet from the bumper of your car. 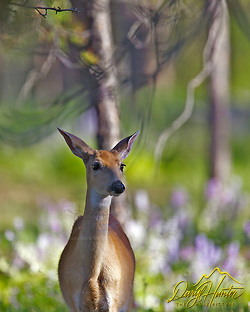 In summer my best deer photos are taken around Signal Mountain, they seem to love the forest there, not to thick so plenty of grasses grow and shady enough to keep cool. The lucky photographer might find backlit deer as the sun breads over the top of the mountain around 10AM when going up Signal Mountain Road. 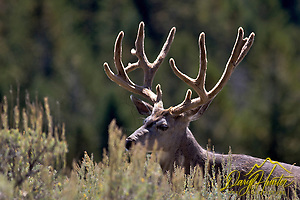 During the Autumn breeding season I find them along the Gros Ventre River area grazing in the sage or cottonwoods where you can find the dominant bucks hanging with a handful of does. During winter, the east side of East Gros Venture Butte opposite the National Elk Refuge is full of deer. There is also usually a nice herd near Kelly on the Gros Ventre/Antelope Flats Loop. One of my favorite photo opps is when I can get a buck on the small bench just north of the post office with the Grand Tetons for a backdrop. Posted on Saturday, February 16th, 2013 at 1:01 pm. Filed under: Blog, Wildlife Tags: buck, doe, Grand Teton Park, Jackson Hole, Monster, mule deer, photography, photos for sale, stock photos, trophy, wildlife	RSS 2.0 feed. My wife Jayne and I had the privilege of being shown around by Daryl. His wealth of knowledge, professionalism, and great eye for the wildlife mannerisms makes any wildlife tour well worth the while. We highly recommend that you take a tour with him. Nice job, Daryl! And thanks for bringing my bag back!